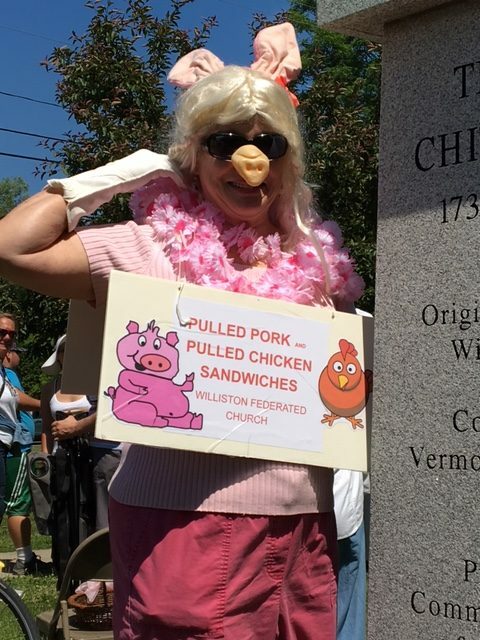 Taking a break from the Hollywood throng, Miss Piggy lends a helping hand to WFC’s Pulled Pork Day … Much thanks to you Miss Piggy! Thank you all so much for your participation in the WFC Pulled Pork and Chicken BBQ. This has been he most fun and best Organized yet! The current total is around $1,400. But there will still be some pulled pork and cookies available for Purchase after church. There are a few folks who warrant special recognition. First I want to thank my husband Michael for getting up early to collect the tables and supplies at the church and bringing them over to the green, pitching the tent and helping set up, hanging the banners, then staying the entire event doing whatever I ask him to do, cleaning up, taking down the tent and bringing back the tables, chairs and supplies to the church. He has done this for 3 years with a glad heart! Vickie Walker and Polly Malik were totally responsible for the purchase and prep of the BBQ and organizing the food prep and delivery the day of the BBQ. Their expertise and skills have been invaluable! Carolyn Pillsbury was our very own Miss Piggy with ears, nose and tail! Her enthusiasm and support were much appreciated! Nancy Stone was quick and creative in updating our banner! And our faithful secretary Sally did an amazing job of creating colorful signup sheets! So just a big thank you to everyone who signed up to bake, pull, contribute and participate the day of the BBQ! With everyone’s help it was a great success!